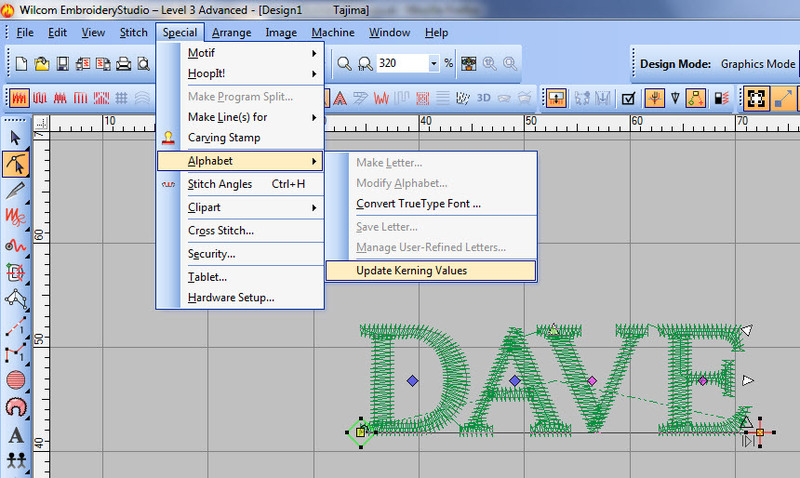 Today’s embroidery design software is more powerful than ever, giving embroiderers a level of creative control that would previously have been unthinkable. However, keeping up with all the different advances and new features that the software companies introduce can, at times, feel a bit overwhelming, especially when there is the more pressing day-to-day concern of getting jobs out of the door. But failing to stay abreast of your software’s capabilities could mean that you miss out on some genuine productivity boosting features. I would, therefore, strongly suggest that you put aside the time you need to thoroughly understand the full capabilities of your embroidery software, and also to learn about any new and updated features as they are introduced. This investment could make a real difference to the efficiency of your workflow and the profitability of your business. Typing words will often throw up uneven, unsightly spacing between letters, as illustrated in Figure 1. You can fix the problem by manually moving the letters to adjust the spacing between them until the text looks correct – a process called ‘kerning’. There is a downside to manual kerning, however – it’s time-consuming, especially as you have to repeat the process every time you enter the same arrangement of letters. Clearly, design software that was capable of automating the process would be a huge time saver. 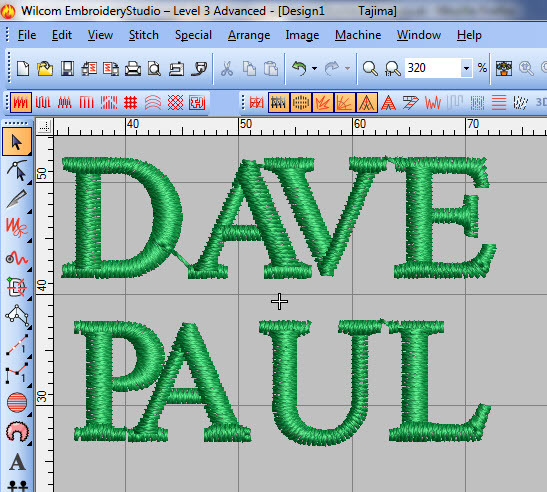 The good news is that Wilcom Embroidery Studio does just that – the software has a powerful learning feature so you never have to repeat the same kerning again. Simply kern the letters to look the way you want, select them, and click ‘Update Kerning Values’ (see Figure 2). The software remembers how you spaced the letters and will do it that way from now on. Dean Roscoe is an award winning digitiser and trainer, specialising in Wilcom and DecoNetwork software. Does updating kerning values update the value used when next to a particular letter, or is it a general value that is used for all letters? For example, spacing between TA will always be better reduced more than spacing between TY. Does it use the same value for both combinations? Yes Jean, The kerning is applied between particular letters combinations, in which the kerning value is updated. The idea is that when user changed spacing between any two letters for a specific font and the click on “Update Kerning Values” menu, new kerning value between those two letters are stored in Kerning table. When user changes spacing for another two letters in this font and click on “Update Kerning Values” menu, system will do the same. And so on. Once Auto Kerning check box is checked for a lettering object with that font, any applicable letter spacing will follow updated kerning table. For instance, if user updates spacing between “AV” and “AT” and stores it in Kerning table for Block2 font. When Auto Kerning is applied, the space between “AV” and “AT” will follow updated kerning table. Therefore, spacing between “AV” and “AT” should be updated for lettering object, “AVAILABLE AT” of Block2 font when Auto Kerning is ON. Excellent – thanks Dean! I hadn’t tried this before, (hadn’t noticed it, actually) but am looking forward to using it! We have level 2 gold. I knew there a system for reformatting kerning vales but have never had the time to work out how to use it! Just tried but the “update kerning values” are greyed out whatever I do. My update kerning values also stays grey. Thank you Dean for this tip! I ran into the same thing Nigel described, but I may have figured it out. Once you have your letters spaced out correctly, and while you are still in the RESHAPE mode, select the letters you want to “update” (ie. change nodes from pink to blue). Now, go to the Special menu, select Alphabet and Update Kerning Values (it should now be available to use). See if that works for you! Sewingtet – you are a genius – thank you!